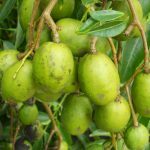 Tropical Fruit – A Tasty Survey, Part VIII - Richard Lyons Nursery, Inc. 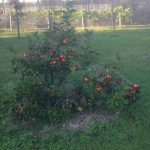 This week we resume our survey of interesting fruit trees that can be grown in southern Florida. 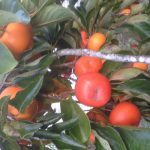 Chinese in origin, the persimmon (Diospyros kaki) is a wonderful fruit which unfortunately has had a reputation for doing poorly in southern Florida. Most of us think of persimmon as a California crop. After all, it was introduced there in the mid-19th century. However, its popularity has led to the creation of more than 2,000 cultivars, and finally Richard Lyons’ Nursery has come upon a hybrid that succeeds in our area. Fittingly named Triumph, this very tasty cultivar will now allow growers in southern Florida to harvest a fruit—sometimes sold under the name Sharon—that is low in fats, high in dietary fiber, and possessed of anti-oxidant, anti-inflammatory and anti-hemorrhagic properties. Persimmon trees are also ornamentally appealing, growing to a moderate size and featuring glossy green leaves. Triumph in particular grows at a very deliberate rate and will not overwhelm even small yards. When laden with fruit, the trees are particularly eye-catching. Triumph bears a tomato-shaped fruit that should be picked when mature—that is, fully-colored but still hard. Left to soften on the tree, the fruit will begin to attract hungry wildlife. The best practice is to leave picked fruit out at room temperature until it softens and its astringency has disappeared. Spondias dulcis has more names than an art thief on the run from Interpol: Pomme cythere in Trinidad and Tobago, cas mango in Cameroon and the Maldive Islands, juplón in Costa Rica, buah long long among the Chinese in Singapore, cajá manga in Brazil, kedondong in Indonesia and Malaysia, ambarella among the Sinhalese in Sri Lanka, golden plum in Belize, mangotín in Panama, and jobo indio in Venezuela. Closer to southern Florida, it goes by June plum in Jamaica and Bermuda. The last name gets the nod at our nursery. In truth, S. dulcis is not a fugitive at all. 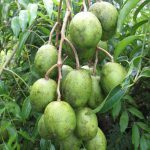 It has lots of common names because of its multifaceted popularity as a fruit source. Originally native to Polynesia and Melanesia, the species’ reputation has led to its distribution throughout the tropics. It was introduced to Jamaica in 1782, and started to be grown there more widely ten or eleven years later when Captain William Bligh brought plants from Hawaii. In 1909 a source in Liberia sent seed to the USDA, but it did not catch on as a money crop in the US, possibly because its cold tolerance is just a few degrees below freezing. The June plum is fairly fast-growing, maturing to the 30-40 ft. range in southern Florida, though more likely to grow 25 ft. taller in its native range. 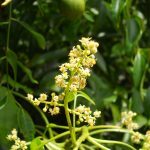 Pollination of its inconspicuous white flowers yields a hard green fruit which often falls off the tree and ripens to a yellow-golden color on the ground. Inside the fruit is a fibrous seed. Eaten raw, June plum fruits are crunchy, featuring a pineapple-mango flavor with a bit of tartness. As they get further along in ripeness, they become softer. The fruit’s versatility has led to its being incorporated into a number of food dishes around the world. It is, for instance, made into jams and preserves and used to flavor stews, sauces and soups. It may be eaten with a shrimp paste or combined with chiles and other spices into a snack food. Elsewhere, the fruit is made into a drink in the company of ginger and sugar. It is also used in curries and, when dried, rendered into a spicy chutney. But the story doesn’t end there. The fruits of S. dulcis are reputed to contain a wealth of qualities that promote good health. Among them are Vitamin A to maintain retinal sharpness and to improve wounds, Vitamin B1 and iron to prevent or treat anemia, calcium to fortify the cardiovascular system, sucrose to increase endurance, and antioxidants to counter free radicals. Leaves and bark of the June plum are also said to possess medicinal properties. It’s not often that Captain Bligh is mentioned in Richard Lyons’ website, but this week you get a twofer: Bligh was the person responsible for transporting this very interesting tree to Kew Gardens from Jamaica in 1793, four years after the mutiny on the Bounty. 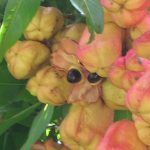 Akee had been introduced to Jamaica earlier in the eighteenth century from its native tropical West Africa. As you might have guessed by now, a botanist named the tree for Bligh. Blighia sapida, as a member of the family Sapindaceae, is related to lychee, rambutan and logan. It matures in the 30-ft. range in our region, with a fairly short trunk and a dense crown. When pruned appropriately, the tree stands up well to hurricanes. 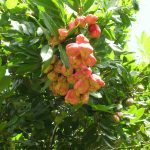 Akee (or ackee) produces fragrant white flowers, but it is the fruit of the tree that receives star billing. 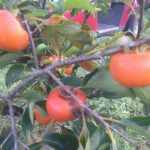 Mother Nature is often quite mischievous, and in the fruit of B.sapida she has created something both poisonous and edible. 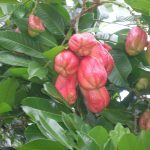 In fact, akee is Jamaica’s national fruit, and akee and salt fish is its national dish! The key to unlocking akee’s charms is timing: Until the pear-shaped red-yellow fruit splits open, or yawns, all of its parts are poisonous. The open fruit reveals three large, shiny black seeds, each of which is partly embedded in a white-yellow pulp, the aril. When the fruit is fully ripe and still on the tree, the arilli are edible. Featuring the consistency and appearance of scrambled egg, they may be eaten fresh or cooked. One simple, tasty preparation is to sauté the arilli in butter. B. sapida is best grown in full sun on a well-drained site. It is quite tolerant of our limestone soils, and a mature tree can handle temperatures into the mid-20s for brief periods. The tree has no major pests or diseases. Richard Lyons’ Nursery carries these species in various sizes.